From the Bonfire, exit out of the bonfire room and kill the Undead Soldier with the crossbow and the three Armored Hollows on the area below to the right. Kill the two Undead Soldiers with spears on the opposite roof top area. Smash the crates (in the spear soldier area) around the stairs going down. 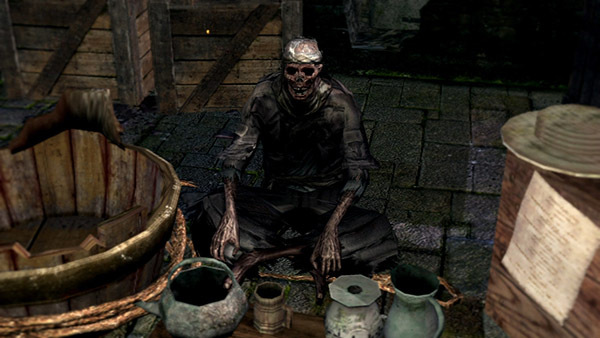 Once in the room downstairs deal with an Armored Hollow hidden behind some crates, as he will surprise you later while talking to the merchant otherwise. The merchant is out of the door opposite to the bottom of the stairs on a ledge. It's best to avoid killing him if you require a constant source of Repair Powder in the early stages of the game. He's also the only merchant that sells Lloyd's Talisman without the Additional Content (if you have the Additional Content, Marvellous Chester also sells it, albeit more expensive). A canny invader can trick a beginner player into swinging at and hitting the merchant out of desperation. In which case the merchant quickly becomes aggressive and attacks with his uchigatana. Be wary that, if you made him hostile, you must progress past the Gargoyles to request absolution. You seem to have your wits about you, hmm? Then you are a welcome customer! I trade for souls. Everything's for sale! Nee hee hee hee hee! I hope you brought plenty of souls? It's actually quite nice here, you know? The hollows don't care for a skinny old twig like me. I've got Yulia… And nobody pelts me with stones anymore. You're Undead, you know how it is. I was treated worse back at home. Of course they're stolen; what did you think? I'll sell it all again! Things are getting treacherous in these parts. A horrible goat demon has moved in below. And up above, there's that humungous drake, and a bull demon, too. If you stick around this place, it might end up being your grave! Ah, this one? Ain't she lovely? Her name is Yulia. She's plumb in love with me. You'd never leave my side, now would you, Yulia? Ah, you can forget it. I'm all that she needs. Careful, she'll bite your little fingers off! Be kind, Yulia, be kind! Eh? I'm not here to chit-chat. We talk business, or we talk nothing at all. Now, don't squander your time chatting! You need to look over my wares! I guessed you'd hoped the twig for certain. Bah, shows what I know! Ah, thank you, very much. Go and fall off a cliff. Throw me a bone, will you? You haven't got much time anyway. Hey, what! What's the matter? It's me! Stop it, I tell you! You've gone mad, have you!? I'll teach you! You lousy rat! 1. It's never clear what Yulia is. 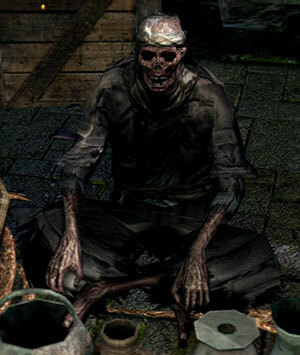 His dialogues may indicate that Yulia is the uchigatana, but it's also possible that Yulia is the bucket, or an imaginary pet in the bucket. It could also be referring to the Undead Merchant Female, as her entrapment behind bars could indicate some forced separation of the two.